Resting, open and desensitized: Scientists at the OHSU Vollum Institute have now characterized the full range of motion for the acid sensing ion channel ASIC1a. The open and desensitized states of the channel had already been characterized by the Eric Gouaux lab. The resting state and the detailed mechanisms for activation and desensitization had remained elusive. In research published March 7 in the journal Nature, Gouaux and first author Nate Yoder presented resting state structures that were determined by x-ray crystallography and single particle cryo-electron microscopy. 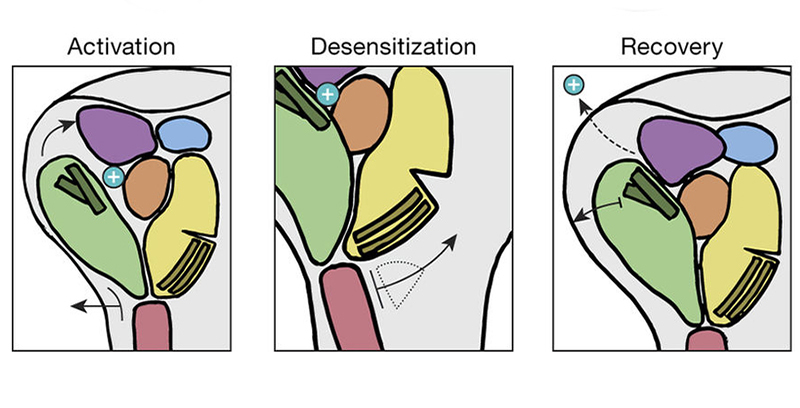 Taken with previous studies in the Gouaux lab, this work provides fundamental insights into the mechanisms of gating and modulation of this channel’s larger superfamily. Throughout the body, ion channels create and close openings on cell membranes to regulate and modulate the transmission of signals in the nervous system. Scientists believe acid-sensing ion channels play a role in pain sensation as well as psychiatric disorders. Ion channels are pursued as targets for stroke therapies, and they have important roles in pain transduction. The next phase of the research will involve studying the channels embedded within tissue to better understand how they interact with other key proteins within the cellular membrane. In addition to Gouaux and Yoder, the study was co-authored by Craig Yoshioka, Ph.D., a research assistant professor of biomedical engineering in the OHSU School of Medicine. Read more about the discovery on OHSU News. The research was supported by the National Institute of General Medical Sciences (5T32DK007680) and the National Institute of Neurological Disorders and Stroke (5F31NS096782 to Yoder and 5R01NS038631 to Gouaux). Additional support was provided by ARCS Foundation and Tartar Trust fellowships.